So apparently Mother Nature thought it would be a good idea to dump several inches of snow on my house while we were away, and we came back to a partially melted mess surrounding trees with green leaves and a 50°F house. Brr. Let's not skip fall, okay? My family loves to eat breakfast together on the weekends, and they adore pancakes. So even though I'm a giant weirdo and don't share their love (except for sourdough pancakes. Be still my heart.) I can't refuse a chorus of small boy voices cheering for pancakes. I really don't like classic pancakes, and one of the only other types I've enjoyed was a blueberry cornmeal recipe I found in my old red plaid cookbook. I decided to take that recipe and give it a twist for the season. 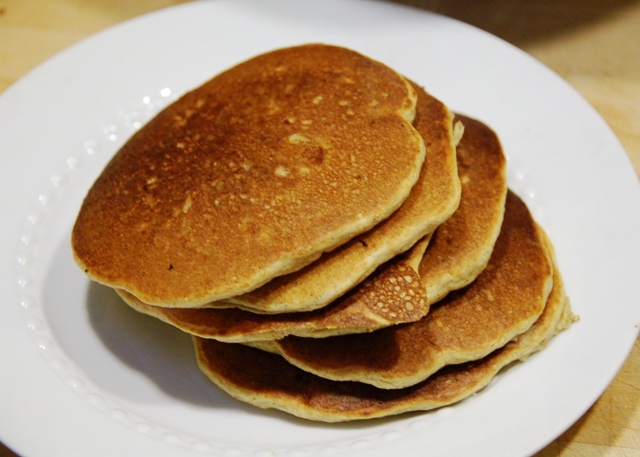 Mix your pancake batter like normal: wet into dry, stir until barely moistened (recipe follows below). Then gently fold in some diced apples right before cooking (I'm sure you could substitute grated ones too if you preferred). Then just watch your pancakes. 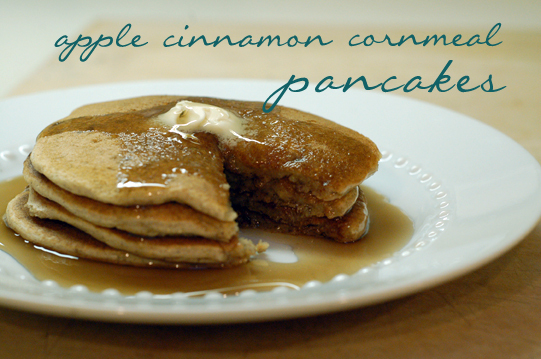 If you're not a big pancake cooker, read on. 90% of the cooking is done on one side, so you don't want to flip it too soon. Wait for the top to dry out, and for the bubbles near the middle of the cake to burst and hold their shape. Once you do flip them, you'll be rewarded with nicely colored pancakes that need to cook on their other side for just one or two minutes. Perfect for a chilly fall morning with family in your warm little nest. Combine flour, cornmeal, sugar, baking powder, baking soda, salt and cinnamon in a large bowl. Set aside. 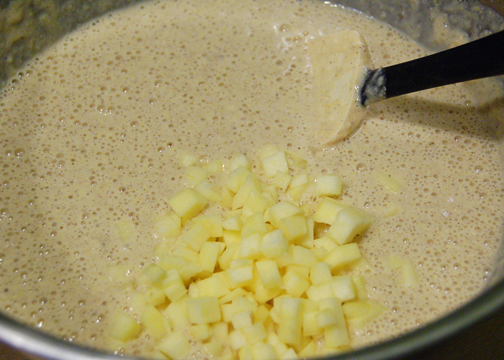 Beat egg in another bowl, then add milk, oil, and applesauce. Add wet ingredients to dry ingredients all at once and stir until just moistened. Gently fold in diced apples. 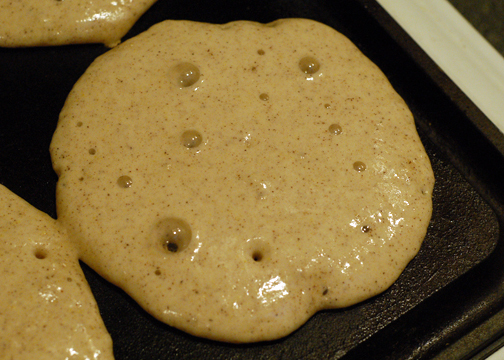 Pour 1/4 c. of pancake batter onto griddle and let cook until top has dried considerably and bubbles in the center of pancake have burst and their holes hold their shape. 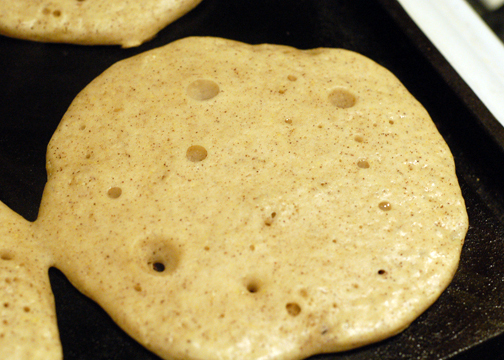 Flip pancake, let brown a minute or two, and remove. Serve hot. mmmMMMMMmmmmMMMmm nom nom nom. I'm LOVING my daily dose of Anna! Jessica, I actually use a seasoned electric griddle set to 400°F and so I don't oil it before pouring the batter. 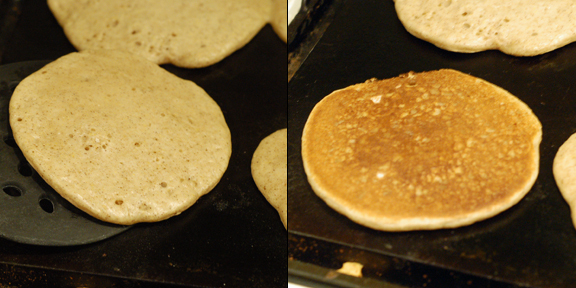 When I oil it the pancakes never turn out right -- they're splotchy and gross. I don't have a great answer for you since I don't have a gas stove... I bought my griddle purely for pancake making. Sorry! I would make sure not to oil your pan, and start at medium high and just experiment from there?